Here are the questions we didn't get to in class today. Feel free to follow up on our discussion by choosing one and taking a stab at it here. Alternatively, if there was anything you would have liked to say in class today but didn't have a chance to--or if there is something that came to mind after we left--please feel free to post it here. Upon learning about Bobby’s death, why does Susannah immediately fixate on Mrs. Shandy’s “green sattin nightgown” (V.vii, 324+)? How do Susannah’s thoughts about clothes advance the story that Tristram is telling here? Why does Tristram “beseech” us readers to “meditate…upon Trim’s hat” (V.vii, 327)? What will happen if you take his advice and do so? Several entire chapters in the reading for today say nothing about the (mis)fortunes of the Shandy family—they in fact interrupt the narrative to address Tristram’s writing/thinking process. Which of these did you find particularly interesting or illuminating or thought-provoking? Why? What are relations like between masters/mistresses and servants in the Shandy household? What is Tristram’s attitude toward the lower classes? Deadline: Saturday midnight (after all, we need to move along to The Female American! But don't worry, we'll be coming back to Tristram Shandy again). One of the chapters where Tristram quits the narrative to address his personal affliction is chapter XI in volume V. In this chapter, Tristram questions his own judgment; "For my own part I never wonder at any thing; and so often has my judgment deceived me in my life, that I always suspect it, right or wrong, - at least I am seldom hot upon cold subjects" (Sterne 331). The reason this passage distinguished itself for me is that, as readers, we tend to put all of our trust in the narrator. We read a story hoping that the narrator is telling us the truth. Especially in eighteenth century literature, it is uncommon for the narrator to deviate from their expected role. However, not only does Tristram's character cause question for me throughout the reading, but in this chapter, he confirms that even he, himself, questions his thoughts. He mentions that his judgments could be right or wrong. This struck me as very odd considering that many eighteenth century novels we have read thus far center themselves on a didactic purpose. How are we as readers, however, suppose to take away a "moral lesson" or a purpose from a novel where the narrator admits to poor judgment on all sorts of matters? I think this passage, at least for me, is one of the reasons that this book distinguishes itself from other eighteenth century novels as being "post-modern". It is also interesting how the narrator presents his thought process to us, it doesn't feel as though he is telling the story for the reader, he is telling it to hear himself talk....He also tends to go off on a tangent in this chapter. He begins by talking about his failure in judgment, and all of the sudden, he is talking about an army of martyrs. His thought process in these chapters reveal a lot about his character; he is crazy. After evaluating the first question, I am not exactly sure why the green night-gown was such a big ordeal. During this scene he makes sure to talk about the exact colors of Mrs. Shandys outfit. "Red damask, orange-tawny her white and yellow lutestrings, her brown taffata" (325). Maybe the green is important because it's a joyful color instead of black, which symbolizes death. Maybe it shows how off guard Mrs. Shandy was with thew news of Bobby's death and her green dress shows how she was not prepared to hear it and she was dressed as if it were any other day. I'm not really sure if either of those conclusions are right, but I feel that the green has to symbolize her unknowing if Bobby's death because if she were to know or expect the news, a black dress would have been more fitting. Maybe I am completely wrong here but I think that the reason that Susannah fixates on Mrs. Shandy's green sattin nightgown is because when the household goes into mourning, all of the clothing will have to be dyed black. I looked up the customs of mourning during the 18th century and found that typically clothing that already existed in one's wardrobe was covered with a sort of black crape or dyed to be black. Susannah goes on to mention some other of Mrs. Shandy's clothing, always mentioning the color and finally saying "O! Twill be the death of my poor mistress [...] No,-- she will never look up again" (325). I'm not exactly sure how my interpretation of Susannah's utterance advances Tristram's story except that maybe it shows that, like Tristram's father, Tristram's mother had a very unconventional way of dealing with her grief? I tend to agree with Krista and Gina - the green night-gown is a strange conversation to puzzle through. I think Susannah is more distraught at the thought of doing away with (or as Krista explained, dying) the green night gown than she is at hearing of Master Bobby's death. Even when she's telling Trim, she speaks of Bobby's death and funeral, AND the necessity of going into mourning all in one breath: "Here is sad news, Trim!... master Bobby is dead and buried... we shall have all to go into mourning" (V.vii). Susannah seems preoccupied with the beauty of her mistress' wardrobe - "her red damask, her orange-tawny, etc" - and it's impending destruction, as being the only effect of her son's death worth lamenting, rather than as a outlet for grief. I think that maybe Sterne uses this exchange as comic relief, perhaps, because otherwise I don't see the point of it. If you follow the conversation between Obediah, Trim, Jonathan, and Susannah, the men are all quite distraught about Bobby's death, but everything Susannah says can be tied back to the death of her mistress's wardrobe. I agree with Gina completely. First, I don't understand why the colors of the gown and the mourning were made such a big deal in the first place. And second, I think that one of the main reasons why the colors of the gown were so heavily emphasized was mainly to change the mood from mourning to happier thoughts. I think that is why :the green satin night-gown was still hung there" (325). I also think that the fabric plays an importance to the gown. Rather than it being any fabric it was satin. I think that satin can represent calmness. It is a very silky looking cloth which is bright compared to many other fabrics. Thus by having it be satin and green it is changing the focus from death to a peaceful, and a natural environment (green being represented as nature). Tristram tells us "ten thousand, and ten thousand times ten thousand(for matter and motion are infinite) are the ways by which a hat may be dropped upon the ground...." (327) I feel like the hat is just the mode through which tristram wants to forward he real message. That message being that the events in the book and the way he describes them are chosen deliberately. Now this should of course be obvious, but sometimes we get lost in the perceived strangeness. There is almost in infinite way he could tell the story. He wants the reader to pay attention to even small things like the way trims hat falls. With all that said, I wasn't really able to discern if there was meaning to the hat's specific fall, beyond the aforesaid mentioned. Something which we weren’t able to flush out in class on Thursday is Brother Toby and the family dynamics. In Bobby’s death, we are able to see the true extent of family support and strength in grievous times. I was truly impressed with the delicacy, care, and detail that went into writing this description. When Walter asks Toby, “Who is gone?” Toby does not respond with, “Your son,” but with “My nephew” (Sterne 316). Although this might mean nothing to others, I believe that Toby’s description of Bobby shows an almost paternal affection he must have had for this young man. Later, as Walter rambles ceaselessly trying to cope with this great sadness, we see Bobby trying to interrupt his speech perhaps with condolence or with an attempt to bring his brother back to rational behavior. At this, Walter takes Toby by the hand and says, “Do not, I beseech thee, interrupt me at this crisis” (Sterne 319). Toby then realizes that this is his brother’s means of getting through the pain. He then accepts his brother’s long winded speeches, and sits, as the kind dutiful caring brother offering his beloved brother support through simply being there, through simply being the ear that might not understand what it is hearing. He looks at his brother with concern and love. Oftentimes, deaths are given grandiose announcements followed by gnashing of teeth and women beating their breasts. The whole city is assembled to hear this dreadful news, and everyone acts accordingly. In my opinion, Sterne’s details of this event, made it seem more believable, more like a family I would know. The news of death is unexpected, as it was portrayed in this novel. 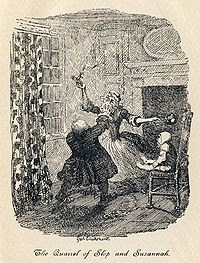 There is sad comedy in the way he relates the story, especially in how Mrs. Shandy finds out of her dear son’s death. Staying true to her character, she enters the room after eavesdropping and declaring that her husband has been unfaithful if he has three children and not just two by her. Despite this comedic relief, we are aware of the traumatic event that has occurred, and Sterne treats it with the utmost care and tenderness as we see Toby lovingly lead his sister-in-law by the hand to tell her of her son’s death. After this whole excerpt, I have found the Shandy family to be very real, and Toby, a loving uncle and brother. Bobby's death was no more remarkable in itself than a hat falling on the ground, except that it was impossible to ignore because it was brought to the household's attention by Toby much as Trim only paid so close of attention to his hat falling because it happened right in front of his face, his gaze drawn to it involuntarily. Only the immediate practical consequences of Bobby's death seem to matter to anyone in the household except perhaps Toby and some of the servants.